The issue of nutritional supplement quality and purity has always been of great importance to Health Products Distributors, Inc. (HPDI). We entered the nutritional supplement industry in 1988 with the intention of providing the most pure and effective products possible and engaged in practices that ensured that our intentions for the highest quality and purity have been met (see below). This issue is very important to me because on a daily basis I am dealing with the selection of ingredients, the selection and performance of our manufacturers, and the monitoring of product quality and testing. The HPDI approach emphasizes quality, minimal fillers, and good manufacturing practices (GMP). Unfortunately, not everyone in the nutritional supplement industry did the same thing as HPDI. This has led to the industry organizations such as NPA and the FDA strengthening the good manufacturing practices (GMP) requirements and ensuring that the companies responsible for producing nutritional supplements were following the GMPs. The issue of compliance with these GMPs is an ongoing concern. 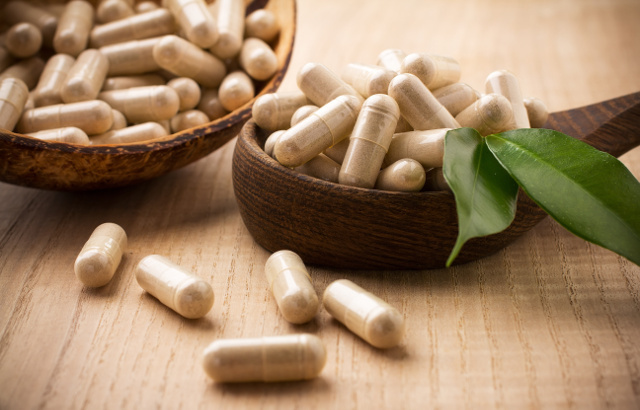 For example, in early February, the Office of the Attorney General for the state of New York sent cease and desist letters to four major US nutritional supplement retailers ordering them to stop selling seven herbal dietary supplements in their store brands. The Natural Products Association (NPA) responded by letter to the Office of the Attorney General for the state of New York questioning the methodology for testing of the herbal ingredients and clearly state that federal regulations protect consumers. The link to the NPA’s letter is here. Formulas carefully designed to include ingredients demonstrated to be effective in clinical trials and research studies. Formulas balanced across the product line, so that consumers do not get either an excessive amount of any ingredient or an inadequate amount of important substances known to be important for balance in the body. Avoidance of a “shotgun” approach in formulation in which every possible ingredient known to be useful for a condition is included in a product. This approach often leads to imbalances in an overall supplement program. We maintain knowledge of latest nutritional research and clinical studies, and also maintain strong personal contacts with knowledgeable authorities in the field. We improve our formulas whenever possible. HPDI uses only the purest ingredients available (often USP or Pharmaceutical grades) and we specify a guaranteed or standardized potency whenever possible. Raw materials are obtained from reliable suppliers dedicated to providing the highest-quality ingredients. Our products are designed not to target price points, but to achieve the best results. For example, we choose whenever possible to use coenzyme forms of vitamins in our formulas that may cost ten times more than the usual forms used by vitamin manufacturers. Coenzyme forms of vitamins are the forms that are used in the body and are usually found in food. 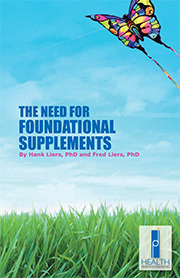 Use of the nutrient carriers best recognized and utilized in the body. We avoid sulfates, chlorides, carbonates, and oxides. As appropriate, we use Krebs cycle bionutrients (citrates, alpha ketoglutarates, succinates, fumarates, and malates), amino acid chelates (arginates, glycinates, aspartates, lysinates, etc. ), and body-specific carriers (picolinates, polynicotinates, etc.). Giving the body options by providing multiple mineral carriers. For example, we often use both Krebs cycle and amino acid carriers. Formulating and packaging products that contain fatty acids to best protect them from oxidation both in the bottle and in the body. This may include the use of a gelcap, Vitamin E, ascorbyl palmitate (fat-soluble Vitamin C), rosemary, or a coated tablet to keep out moisture and oxygen. 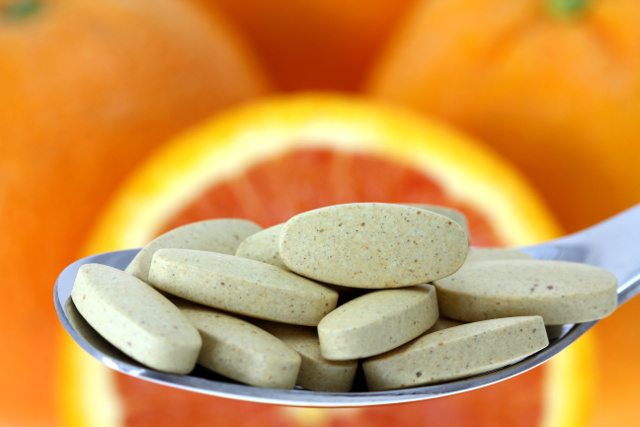 Our manufacturers generally include desiccants in the bottles of capsules and tablets in order to retain freshness. Minimizing or Eliminating Unnecessary Fillers, Carriers, Excipients, Food Antigens, Preservatives, Coloring Agents, and Other Additives. Exclusion of wheat, gluten, corn, dairy, eggs, yeast, simple sugars, preservatives, artificial colorings, and artificial flavorings in our products. Exclusion (with just a few necessary exceptions) of rice, rye, barley, oats, soy, tomatoes, wax, and salicylates. Exclusion of dicalcium phosphate, rice powder, or synthetic fillers such as povidone. When absolutely necessary, we only allow USP grade microcrystalline cellulose as a filler. Avoidance of all lubricants with the exception of magnesium stearate, stearic acid or ascorbic palmitate in small amounts (less than 2%) when necessary for successful manufacturing of tablets or in some cases capsules. We conduct business only with manufacturing companies that are trustworthy, understand HPDI’s philosophy and approach to product formulation, pay close attention to our guidelines, and have excellent reputations for using “good manufacturing practices” (GMPs). We have worked with many of our manufacturers for over 10 years. For any new manufacturers we work with, an intense education program is engaged in that quickly brings them up to date concerning our demands for high-quality products. HPDI products are produced by manufacturers of superior-quality supplements following FDA manufacturing guidelines and who have cGMP certifications from the most demanding certifiers such as NSF and NPA. In conclusion, I want to assure you that HPDI is continually monitoring the quality of the products we provide to our customers and improving them in any way possible!! The recently published annual report of the American Association of Poison Control Centers indicates no deaths from dietary supplements in 2013. The annual report was published in the journal Clinical Toxicology and was based on information collected by the US National Poison Data System (NPDS). The report also indicated no deaths from any amino acid product or herbal product. No deaths were caused by any dietary supplement in 2013 according to US NPDS data. (OMNS Jan 16, 2015) There was not even one death caused by any dietary supplement in 2013, according to the most recent information collected by the US National Poison Data System. The new 251-page annual report of the American Association of Poison Control Centers, published in the journal Clinical Toxicology (1), shows no deaths whatsoever from any dietary supplement. Additionally, there were zero deaths from any amino acid or herbal product. This means no deaths at all from blue cohosh, echinacea, ginkgo biloba, ginseng, kava kava, St. John’s wort, valerian, yohimbe, Asian medicines, ayurvedic medicines, or any other botanical. There were zero deaths from creatine, blue-green algae, glucosamine, chondroitin, melatonin, or any homeopathic remedy. Furthermore, there were zero deaths from any dietary mineral supplement. This means there were no fatalities from calcium, magnesium, chromium, zinc, colloidal silver, selenium, iron, or multimineral supplements. Reported in the “Electrolyte and Mineral” category were two fatalities from the medical use of “Sodium and sodium salts.” These are not dietary supplements. If nutritional supplements are allegedly so “dangerous,” as the FDA, the news media, and even some physicians still claim, then where are the bodies? 1. Mowry JB, Spyker DA, Cantilena LR Jr, McMillan N, Ford M. 2013 Annual Report of the American Association of Poison Control Centers’ National Poison Data System (NPDS): 31st Annual Report. Clinical Toxicology (2014), 52, p 1032-1283. ISSN: 1556-3650 print / 1556-9519 online. DOI: 10.3109/15563650.2014.987397. Andrew W. Saul, Ph.D. (USA), Editor and contact person. Email: omns@orthomolecular.org. This is a comments-only address; OMNS is unable to respond to individual reader emails. However, readers are encouraged to write in with their viewpoints. Reader comments become the property of OMNS and may or may not be used for publication. 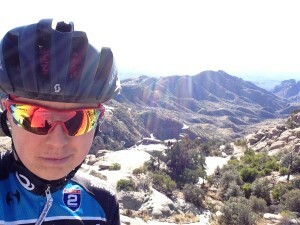 This month we highlight a recent article from the blog of pro women’s cyclist Irena Ossola, HPDI’s sponsored athlete. Irena works hard during the off-season to maintain balance in her life and regimen whether cross-training, working on her core, optimizing nutrition, or balancing (literally!) on double-stacked bozu balls. Balance for strength. Balance for training. Balance for life. Particularly in the off season it’s so important to work on balancing exercises for core, isolated muscle work, and for technique. Because so much of cycling and racing involves balancing on the bike, practicing and working on basic balance exercises is important. From being able to hold a track stand, to standing on the pedals as you climb a hill involves core strength and balancing on the bike. But even for non cyclists, balance exercises are great for strengthening and fitness. Using a large yoga ball, bozu ball, or with foam pads you can do various drills and keep it fun too. A great trainer in Santa Fe, Michael Canning, has worked with me on various exercises and cyclist specific strengthening. Like in the pictures, pushing my boundaries of balance with these double stacked bozu balls. In training I have learned first hand over the past year that strictly riding can lead to problems. It’s important to give yourself the flexibility in training to change things up and also include cross training or other activities that help keep your body and mind in balance for the focus of training. Incorporating swimming, yoga, gym exercise, hiking, and other fun activities keep your body moving and gaining fitness while also giving it a break from pedaling or working 100% of the time. After suffering from a pinched nerve last year and back problems I make sure to include swimming, stretching and core into my training routine. Balance in nutrition is also key to being able to feel good and train hard. Thanks to the Rejuvenate! superfoods and supplement products from Integrated Health I’ve been able to recover quicker and feel stronger after every workout. Even days of rest or lower activity I’ve seen the effects of eating clean and maintaining the fundamental basics of magnesium (which I’ve learned is soooo important for muscle function), a multivitamin, omega’s, and a Nrf2 protector formula. Protein, fruits, and vegetables, and a balanced diet are the essentials for training consistently. Leading your life simply focused on one destination or goal will always keep you in the future and not living the journey. The present moment is the best you’ll ever have and you never know what tomorrow will bring. Planning and goals are important, but also knowing that those goals will never be achieved without living now. 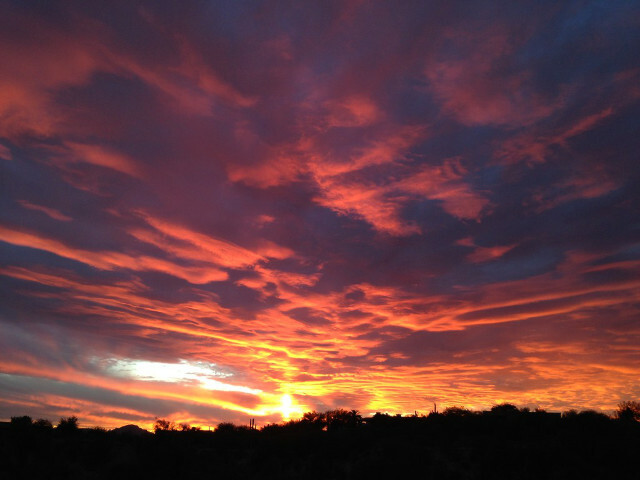 Since I spent a week in Tucson over Christmas, I’ve been back in Santa Fe working and training. The weather has been a bit back and forth between warm and cold. So when it’s cold, I’m inside on rollers/trainer, in the pool swimming, or in the gym. When it’s warmer out, I’ve been riding either my cross bike on trails or on the road, and hiking also. I’ve gone on a couple great all day hikes with Michael and my friend Hannah up to Baldie (a peak just behind the SF ski area). Such a great workout and something to mix things up in training. Here are some of the pics we got. 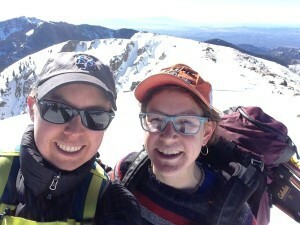 My friend Hannah and I on our hike adventure. 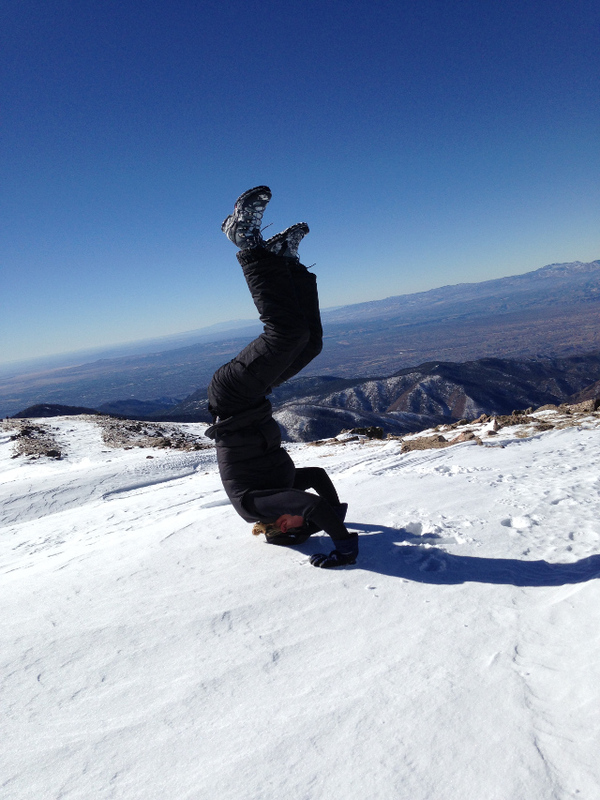 Headstand on top of the mountain. Last week I made a resolution…not for 2015, but for the last week of 2014. To be the badass cyclist that I am and ride till I showed 2014 what I was made of. And I did. I escaped the cold snowy rollerville of Santa Fe, NM and drove out to Tucson, AZ. I took the week of Christmas to be in the best place I could for myself, with Alfred (my bike). 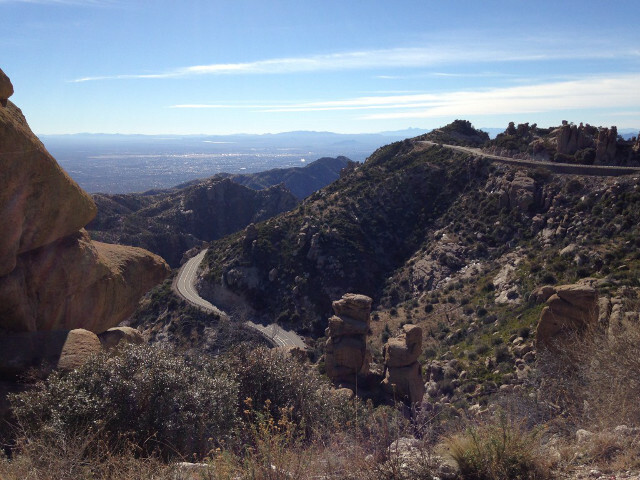 I trained in Tucson, AZ during Christmas week. Sometimes with training, and even life you have to step back and look at what you really want and enjoy. It’s not about the money, or presents, or material things, but the experiences, adventures, and lifestyle you have. Whether you’re with others or experiencing something for yourself, it’s about the moments that bring alive that true happiness within you. I resolved to be free on my bike, exploring the parts of my mind and internal problems that I can only reconcile on Mt. Lemmon in those deep long hours of climbing and pedaling. And 27 miles uphill gives plenty of opportunity for that. There are places, our happy places, where everything just disappears and the world somehow feels right….This picture is from one of mine. Hoodoo Vista, Mt. Lemmon. Roads wind up the mountain. With fitness, especially as a professional athlete we know our bodies so closely and know when we are fit or feel good. And usually through the somewhat inconsistent off-season of cross training and indoor spinning we think winter means being out of shape and holiday off time. But sometimes we surprise ourselves. Getting in the time and effort to be active and stay healthy can reap benefits also. For a few weeks before going to Tucson I have had a pretty boring routine of training. A roller wake up call before dawn to spin, then swimming before heading to work. After a long day of work I settled myself onto the couch for a long movie…ha ha just kidding…onto the trainer for a couple hours of spinning, or at the gym for some lifting and exercises. So arriving in Tucson and riding up Mt. Lemmon that first day I completely surprised myself with how fit and strong I felt. 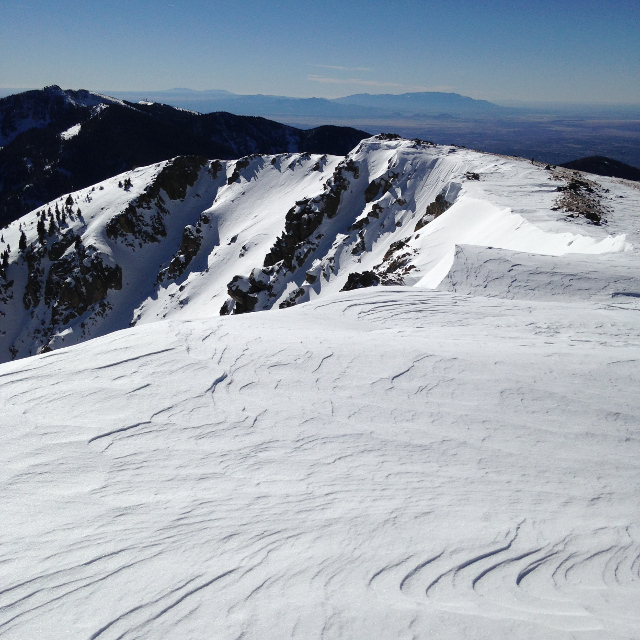 And it continued….The whole week I was able to keep endurance and stamina to ride hours beyond what I had been able to while in Santa Fe. Riding to the top of Mt. Lemmon. Cold at the top with snow. I really learned the direct effects of core and the importance of keeping consistent. I could stand on the pedals and balance with an agility I’ve never felt quite like this before. So get in those planks and crunches! It’ll pay off! I also realized how my nutrition and diet could push me into feeling more energy and the benefit from what I put in my body. Supplements and recovery mixes have balanced out my diet where I feel the effect of magnesium and other base nutrients. 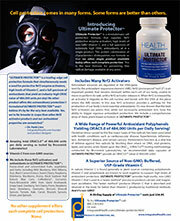 I have been using product from Health Products Distributors, specifically their Rejuvenate! superfood mixes and Myo-Mag supplements that are essential for feeling good in every lifestyle, whether a pro athlete or not. Feeling good and working out hard is such a balance, and so much of the time it’s a matter of balancing real life with our dream world of training. Setting yourself up for success comes from planning and knowing you can do it, then it becomes part of your every day. I don’t usually post my workouts, training or numbers. But last week was such an amazing solo bike camp adventure that I just have to share it. I rode a total of 30 hours and 50 minutes, with one day of rest mid-week also (rest is so important and never to be neglected). 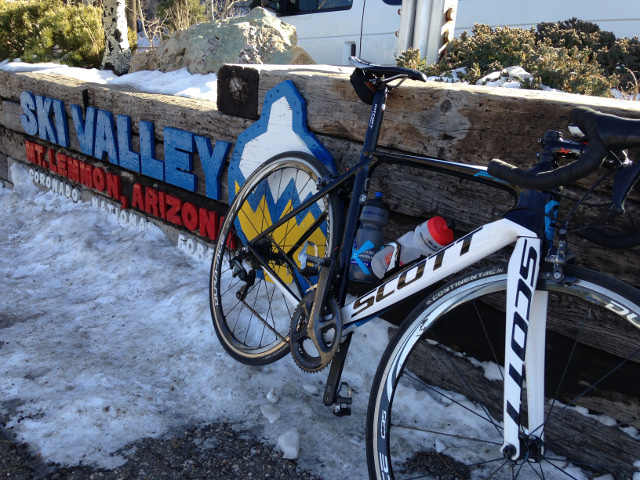 Rode 460 miles (740 km), max speed on descent 50 mph, and climbed 31,315 ft (9544.8 m) in elevation. Can’t wait for what adventures await me in this upcoming year. 2015 LET’S DO THIS! Windy Point over looking Tucson (you can see people on rock if you look carefully). 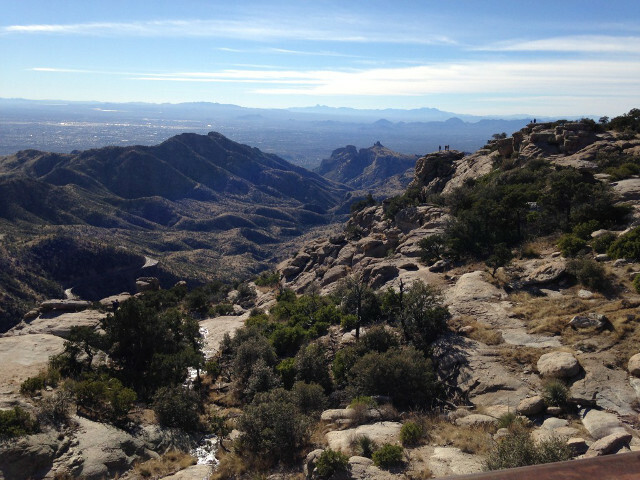 Settimana scorsa sono stata a Tucson, Arizona per 7 giorno ad allenarmi al caldo e fare tante kilometri e salite. E stato bellissimo facendo piu di 30 ore in bici, 740 km di distanza, e 9544m scalata in montagna. Ancora tanto tempo per preparazione ma sono pronta e contentissima per il prossimo staggione.